Probably the most common concern I hear from female runners as to why they do not want to, or simply don’t, touch weights. I cannot stress enough that this is a total myth that couldn’t be any further from the truth. Unless you are on a strict training regimen involving a program that is focused on building mass and a nutritional and supplemental plan specifically meant to bulk up, you are most likely NOT going to turn into the Incredible Hulk with 2-3 times total body strength workouts a week. Building lean muscle mass will actually help kick start your metabolism, turning you into a lean mean fat burning machine, improving your body composition (ie, decreased body fat and weight loss). Any time you engage in a new type physical activity, there is that fear of potential injury, which is totally understandable. 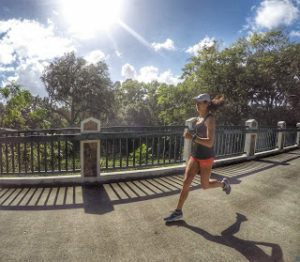 In fact, you may have experienced an injury before when you made drastic changes to your training like improperly introducing speed work or upping your mileage too rapidly. But when done properly and progressed appropriately, strength training will not hurt you, rather it will help you in injury prevention. Strength training helps to improve not just the muscles but also increases strength in connective tissue (ligaments and tendons) and bones, helps to provide stability and mobility where needed most, improves posture and coordination, and helps to correct muscular imbalances. Strong muscles, ligaments, and tendons guard against impact, improve form, and lead to a consistent gait. The more strength you have, the more resilient your body will become to the repetitive impact of running won’t wear you down as much. And not only will your body be able to better withstand the demands of distance running, you will also recovery much quicker. So thus, with strength training, you will not only be stronger and leaner, but you will be a much more efficient runner with much shorter recovery times, drastically decreasing your risk of injury! I have had more than a handful of people tell me they are afraid to lift weights and build muscle because they feel it will slow them down. But again, this couldn’t be further from the truth. By now we have established that strength training will improve body composition, help metabolism, improve strength in connective tissue, improve form and running economy, and aid in recovery. A well rounded strength and conditioning program will also help to improve power and agility, which will come in handy big time during speed work. Not to mention the mental toughness you will get from pushing yourself in the weight room will translate to real time race conditions, where we all know that we not only need to be prepared physically but be mentally tough to fight through! So unless you plan on turning into the Hulk (see above), your lean, strong muscles you build from a strength training program will NOT make you slower, but rather make you a more proficient and faster runner! I recognize that we are all busy. We have work, family, training, a social life and other hobbies. So the thought of adding yet another task to your already packed schedule may seem impossible, right? Well, maybe not if you do some reorganizing and prioritizing. Most beginner to intermediate run training programs suggest athletes run 3-5 times per week, so that leaves you 2-4 days of cross training, as well as one rest day. Many runners use their cross training days for other steady state cardio activities (ie, biking, swimming, elliptical) or even just running some more. Although these activities offer some great benefits such as improving overall cardiovascular health and increased stamina, a more well rounded program would be one that includes at least 2 days of strength and conditioning. So maybe consider swapping out an elliptical workout or a day of “junk miles” for a weight training sesh. Also, you do not have to spend hours at the gym to see improvements. 30-45 minutes is typically enough time to get everything you need out of a great weight lifting workout. So even if you only have an hour, you technically can still do both with 30 minutes of weight and 30 minutes of cardio for your cross training days. See, maybe you do have time after all! Often friends and strangers (via social media) alike will reach out to me with incredibly complex questions about getting started on a strength and conditioning program. They may have found something on the internet, read an article in a running or fitness magazine, or overheard a trainer at their local gym and are now terribly confused of the how’s, what’s, when’s and why’s of strength training. I admit, if you are a weight lifting newbie, it can certainly seem overwhelming. From free weights and machines, to MetCon and HIIT, to Olympic lifting and Cross Fit, there are a million and one ways a runner can workout. So how do you chose? The simple answer is, you do not have to chose just one, or any for that matter. Just like when you started running and most likely knew nothing of speed work, Fartleks, tempo runs, etc., you can and should start off simple with strength training. Basic movement patterns involving all of your major muscles groups is a great way to build a solid foundation. Once you have mastered basic body weight exercises, such as squats, lunges, push ups, planks, etc., you can add an external load like a dumbbell, medicine ball or kettlebell, as well as begin incorporating more dynamic and functional exercises. The key to starting anything new is to start simple and progress from there! For more information and guidance on strength training for runners, check out the Strength2Run services page or contact us today!